There is no more literal retro design interpretation than the Dodge Challenger’s. The 2009–14 model, which received a mild facelift for 2011, including a new V-6 and electrically assisted power steering, is closer in styling to its 1970-74 forbear than archrivals Chevrolet Camaro and Ford Mustang. But the problem with doing retro is, how does one update the car? One way is to evoke some iconic early ’70s performance packages, which is fairly easy when you’ve got rear-wheel drive and Hemi engines in your arsenal. For 2015, the Dodge Challenger will be offered with the R/T and R/T Plus Shaker packages, with the 5.7-liter Hemi offering up to 375 hp and 410 lb-ft of torque. The latter package comes with the recently revived shaker hood option. For the 2015 Challenger’s styling facelift, Dodge looked to the 1971 model, which added two horizontal, rectangular grille inserts that essentially split the ’70 Challenger’s grille design in halves and replaced the ’70’s full-width taillamps (as connected by the center backup lamp) with two separate lamps. The 2015 Dodge Challenger also features a more prominent power bulge in the hood. 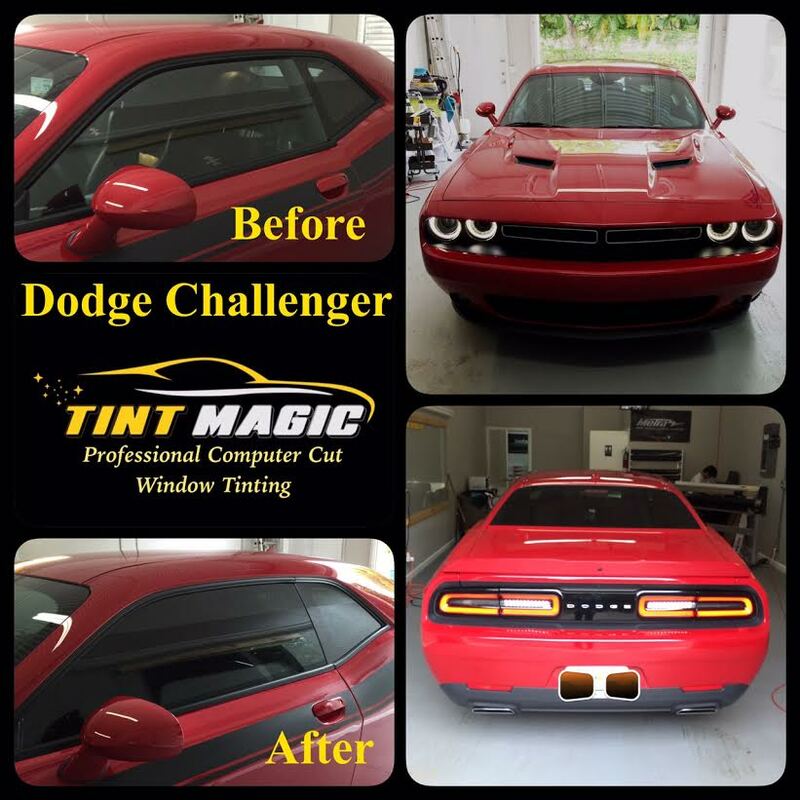 Tint Magic Window Tinting has applied on Dodge Challenger 18% carbon film window tint all over the glass for up to 43% heat rejection and 99% UV protection. We use computerized cutting system to pre-cut window films for a perfect fit everytime. Tint Magic Window Tinting is located at 11344 Wiles Road Coral Springs, 33076. Tint Magic Window Tinting serving Coral Springs, Parkland, Coconut Creek, Sunrise, Werston, Tamarac and Margate.